Join us for a “shoes and shopping” event! Looking for something fun to do with friends this weekend? Join us for “Shoes & Shopping,” Saturday, May 2nd from 10-4:00, in the lovely New England seacoast city of Portsmouth, NH. 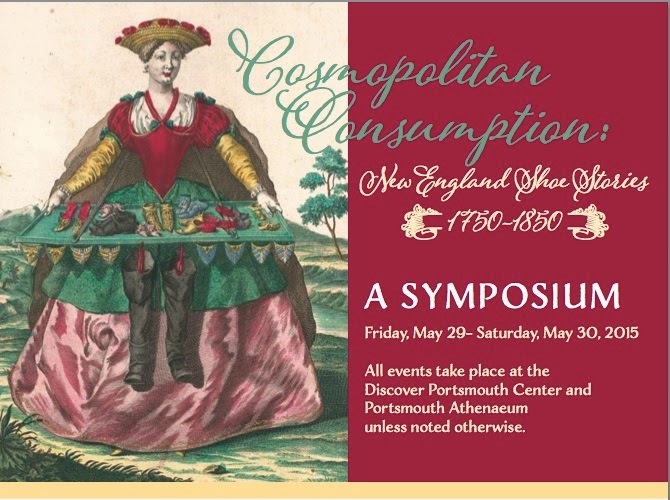 Bring a few friends and tour the exhibition “Cosmopolitan Consumption: New England Shoe Stories, 1750-1850.” The exhibit is free and the curators, Kimberly Alexander and Sandra Rux, will be on site offering tours for those who are interested. The program is one of the series offered by the Portsmouth Athenaeum (Information here: www.PortsmouthAthenaeum.org) in conjunction with the exhibition. 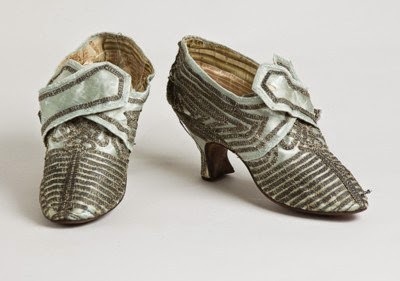 A diminutive pair of pale blue silk shoes adorned with a profusion of costly metallic braid or lace clad the feet of Eliza Pinckney (1722-1793) sometime in the 1760s or 1770s. (They are 6.75 inches in length with a heel a smidge over 2 inches in height.) 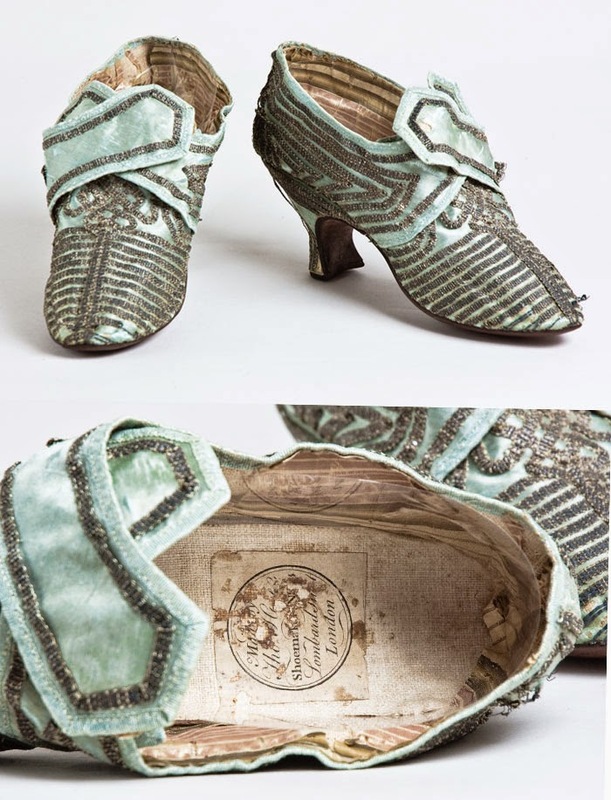 It is certainly fair to note that these light blue silk satin shoes are distinctive. The fact that we have the name of the wearer of these elegant pumps, Eliza Lucas Pinckney, places them into the category of rare and significant clothing survivals. Made in London, they bear the label of the Cordwainer Thomas Hose, whose shop was located in the heart of the Cordwainer's Ward on Lombard Street. A well-articled geometrical pattern was created by the careful placement of metallic braid. (This is especially striking in the outline of the heel and culminates in a stylized floral motif at the vamp.) The design is intriguing – for example, the slender Louis heel is made to appear even more slender by the placement of the braid. In an unusual treatment, and offering further evidence that the shoes were a costly item, much of the interior was lined with two separate striped silks of a salmon pink and white, and an olive and tan. Silk also lines the underside of the tongue, though this detail is found more frequently in high-end shoes of the time. It often goes unnoticed due to damage of this delicate area. 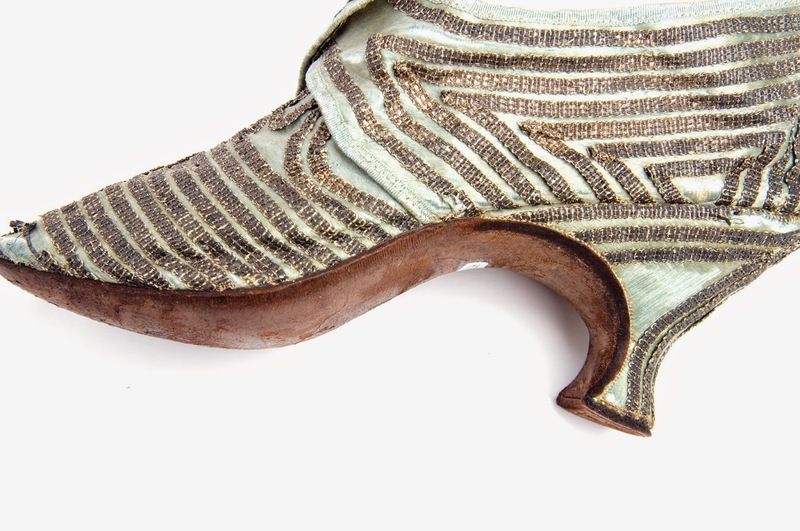 The treatment of the inside of Eliza's shoes offer an instant visual 'pop' and in this case, the like of which I have yet to see so fully treated. It is of interest because she (and perhaps one or two intimates, such as her husband) would be the only one to notice this inside detailing. Eliza was married to Charles Pinckney, lawyer, judge and member of the House of Commons. Eliza is best known for her perseverance and success with her father’s indigo crop, ultimately making it a prosperous crop in the Lowcountry (South Carolina) until the war. I ended a nearly five year pilgrimage to view these shoes in person on April 21, 2015. My appreciation to Jan Hiester, the Charleston Museum Curator of Textiles, for her generous assistance. Continued thanks to Colin Hose and Linda Pardoe for so generously sharing information on the Hose family. All illustrations are courtesy of the Charleston Museum. 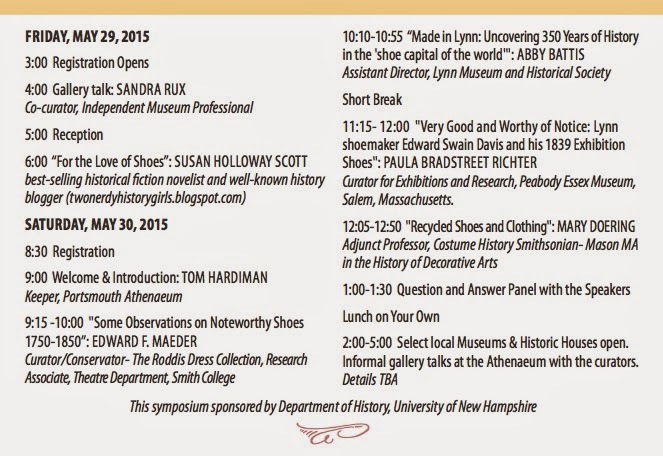 A Symposium on Shoes, Planned in Conjunction With "Cosmopolitan Consumption…"
Are you fascinated by historic shoes? Do you want to learn more about the roles footwear has played in people's lives and the styles they wore and why? Do you want the inside scoop on some of the latest museum projects involving cataloging & accessibility of collections? 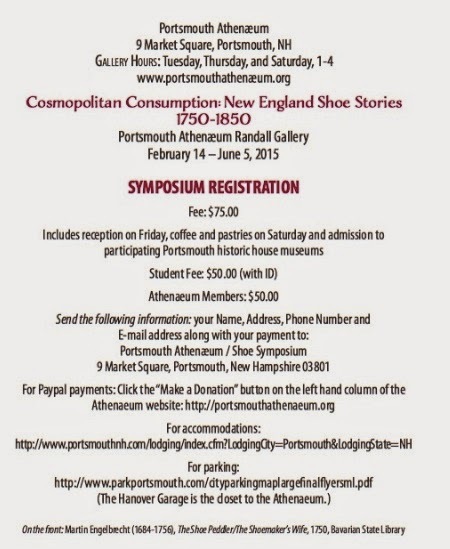 Then join us for a symposium on shoes, planned in conjunction with "Cosmopolitan Consumption: New England Shoe Stories, 1750" May 29th-30th, 2015. Sponsored by the Portsmouth Athenaeum and UNH History Department. Exhibit Curators and Symposium Organizers: Kimberly Alexander, Ph.D., and Sandra Rux, with assistance from Jeffrey Hopper. Design by Phineas Graphics. this was her first marriage, while it was Nathaniel's second. Even at first glance, it is clear the shoes are unusual in their composition. One shoe has been built up at the sole and heel to accommodate the difference in the length of the bride's legs--she was lame. Therefore, the height of one of the heels is 1.25" and the other is 2.75”. How was this accomplished? A special wood “platform” was added to one shoe. Using the same quality materials which comprise the shoe textile, special care was taken to match the front portion of the "addition." It is neatly, even meticulously sewn. More study is needed of the wooden super structure, its method of construction and attachment, and any interior details. The style, quality of material and work would indicate a London manufacture, special order, or an especially highly skilled British American cordwainer. Rather than hide her "infirmity" by wearing less attractive, but practical, heavy leather shoes built up on the inside or outside, Mary appears to have made the decision to celebrate her wedding in the elegant style of the times. The silk of her brocade shoes would have caught glints of light as she walked, as would the glittering buckles. Her shoes were not meant to be hidden. She may also have been bowing to familial wishes, but I like to think that she expressed her intentionality through a conscious decision. Then as now, most brides want to look their best on their wedding day.